Typek is a locally produced office product favoured by businesses, retailers and stationers for its quality and distinctive red packaging. Typek is unique in that it is manufactured from waste sugar cane fibre with the remaining fibre coming from well managed and sustainable plantations. Typek also carries the Earth Kind™ label which is a visible, simple and relevant icon that captures the essence of Sappi's and Typek brand’s approach to sustainability and corporate citizenship. The Earth Kind symbol is a heart symbolising humanity, placed inside an orb shape that depicts the earth, encompassing nature and the people who inhabit it. A combination of superior smoothness, good ink adhesion and colour reflection makes it the best choice for professional looking documents and is suitable for use in multiple office copiers and laser printers. More businesses use Typek. 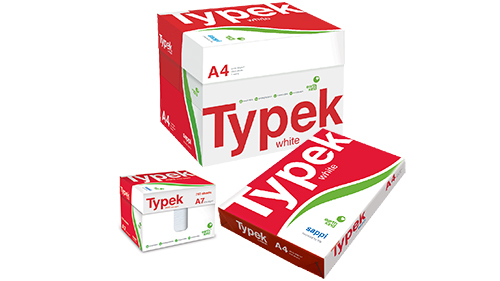 Typek White is a multi-purpose office paper engineered for all types of office equipment. Find out where you can buy Typek from. Learn more about Sappi's Earth Kind seal.